By now, hopefully, everyone knows the importance and power of Buyer Personas. Understanding who our buyers are, what drives them, how they are measured, the key issues they face, and all sorts of other things enables us to connect and engage them more effectively. We can focus our content and our discussions in ways that are most impactful and meaningful to them. We can talk to them about the things they are most likely to be interested in in their “language.” We can create and communicate value in terms that directly impact their success. Personas have shifted the way we develop much of our content. Our playbooks teach us about each of these roles, and guide us to engaging them in high impact conversations. But too often, our conversations break down. We know what they care about, we know how we should be talking to them, but we fall short in our abilities to actually have the right conversation. As an example, a few months ago, a SDR called to discuss sales performance management. It’s a topic near and dear to my heart, it’s what we speak about with all of our clients. 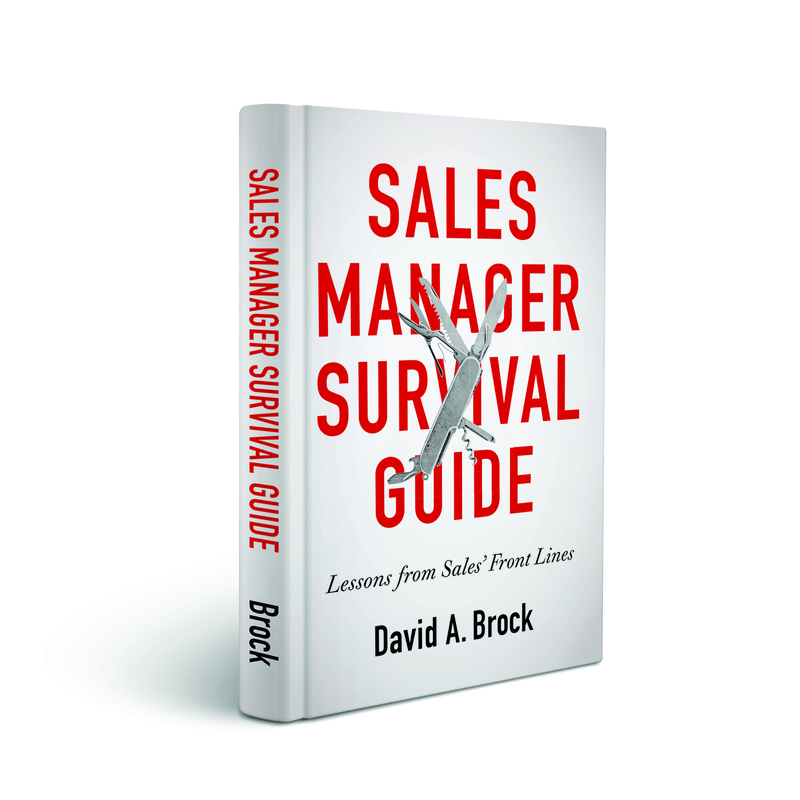 a core theme of Sales Manager Survival Guide is sales performance management. She then started to talk about a whole bunch of metrics, number of calls per day, call duration, and more. At this point, the call was going downhill very fast. To the sales person’s credit, she understood. She was trying to get out of the call, suggesting a follow up call from an account manager or a demo—I have to give her credit, she went for the demo. She clearly recognized she was way over her head. She wasn’t able to support her end of the conversation. She’s a BDR, focused on outbound prospecting calls. She’s been doing this for a little over 12 months, it’s her first major sales job. She had a playbook, she had a script—all of which she was executing pretty well, but she wasn’t able to engage me on a conversation that I was interested in being engaged. And it’s unfair to expect her or most other BDR/SDRs to engage senior sales leaders in a meaningful conversation about sales performance management. Particularly, if the engagement strategy is to bring insight and help the customer learn. It’s not arrogance on my part, I want to learn from anyone I can. It’s the things that keep me up at night (and those that fit my category of persona) require some experience base in business or sales management. Experience that a playbook is not likely to give. She simply didn’t have the experience base. She could read her script, but as I started to ask questions, as I wanted to deepen the conversation, she wasn’t able to do this. And it wasn’t her fault. I wonder how many opportunities BDR/SDRs miss simply because they can’t hold up their end of the conversation? I wonder if we might be more effective in our prospecting if we started thinking about the Seller Personas, aligning the right sales people with the buyers? 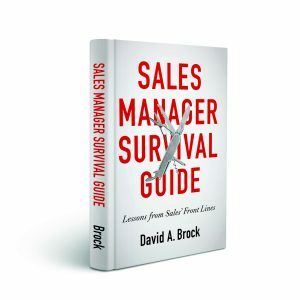 What if this company had assigned a more experienced sales person–perhaps one being developed to be a front line sales manager? The quality and level of engagement in that conversation would have been much deeper, it probably would have provoked me to ask for more. We already know the power of this in other types of sales specialization roles. As our products and solutions become more complex, it’s impossible for the sales person to have deep enough knowledge on all the products. For decades (perhaps even millenia), we’ve had specialists. A person who knows the application area, the solution very well. For example, I often hired people who had been manufacturing managers to sell manufacturing control systems. Or engineering designers to sell product design solutions. We know that if we are going to engage the customer in deep conversations about their business or function, we have to be able to hold up our end of the conversation. Yet in the very first call, we throw people who are ill equipped—experientially and knowledge-wise–to hold up their end of the conversation. We try to engage with insights yet when the customer says, “tell me more,” or “what about,” or “why should I be thinking about that,” or “I don’t agree,” we can’t continue the conversation other than to suggest we arrange a follow on meeting. We have the opportunity to engage the customer in the very conversations we want to have, but we fail in the very first conversation. Why should the customer continue? What if we started rethinking our outbound strategies? What if we started thinking about sales personas? What if we started aligning the right sales personas with the right buyer personas? What would that do to our conversion rates? In our own company, we’ve had that strategy for years. There are certain personas that I’m less effective with than other members of our team. There are certain industries or markets that I’m less effective with than other members of our team. As we look at our outbound prospecting conversations, we align who we are calling — persona, industry, market, solution—with the best people in our own organizations. Our “connection rates” are very high, the people we reach feel we can offer real insight and value, consequently are excited to have a conversation. Not all of those convert–at least immediately–but we’ve had a high impact conversation and established the start of a relationship we can nurture over time. Our first conversations lay the groundwork for any future conversations. Our first conversations create lasting first impressions about our companies, our solutions, and our potential to create value. Doesn’t it make sense to align the right selling personas with the right buying personas? If we sell IT development tools, to development managers, how much more effective would we be if our people had at least watched an IT development team doing a project? Or had participated in some way themselves? If we sell manufacturing control systems, how much more effective would we be if our people had spent a little bit of time in a manufacturing facility or had a manufacturing background? If we sell sales and marketing automation systems to executives in those functions, how much more effective would we be if we had people who had managed or lead a team before? Perhaps as we look at the people we put into SDR/BDR roles, as we look at maximizing the results we want to produce, we need to rethink who we put into those roles, better aligning them with the customer personas we expect them to engage. 1) A pervasive focus by leadership on cost reduction with the unintended consequence of dulling sales performance (i.e. creating a low cost BDR team so more experiences sellers are not “bothered” with the early stage connection and just handle pre-qualified opportunities). 2) The resultant mismatch of inexperienced BDRs being expected to execute on an insight based sales approach (what it seems you experienced). 3) Lack of appreciation by leadership of the depth required to effectively implement the insight based approach. Matching the sales persona and senior level buyer persona requires more than creating a cost driven organizational structure and then handing these inexperienced (low cost) sales people an insight “script”. Don, I couldn’t agree with you more. While I think there is great power to the concept of SDR/BDRs, too often, I think we select the wrong people for what we are trying to achieve. It is unfair to them and doesn’t produce the results we want to have a mismatch in persona/level in our very first engagement with the customer. Sometimes, I think we have it backwards, we may actually want to put our very best people in SDR/BDR roles-particularly if the target prospect persona is a C level executive. Great post. Yet, I would say it has always been the case great reps, top performers, were those individuals that have great communication skills sales presence, and business acumen. With the change in buyers journey in the age of social selling, companies have failed to coach the interpersonal skills that are required to be able to have the presence to talk to those at the C table. My question to you is how are you seeing companies retooling the reps to make them more sophisticated? Donna: What a fantastic and important question. The short answer, “Yes, but mostly no.” Too much of what I see is the focus on efficiency and less on effectiveness. For example, the SDR/BDR role is a powerful approach to specialization, but it fails if the person isn’t able to have the right conversation with the customer. Much of the current thinking is around efficiency and cost, not effectiveness. So it’s easy to hire lots of BDR’s at $50-$80K and have them make 1000’s of calls—it’s the premise and error underlying Predictable Revenue. We see similar things with the rush in the application of technology to improve sales efficiency. In many cases, the reliance on technology serves to dumb the sales person down, substituting technology for sales capability. This drives more consistent, predictable results, but only to the degree it works. Unfortunately, the customer is seldom considered in this, or their experience. But here again, the application of technology focuses on efficiency and then we just drive the volumes up. I forsee much of this will come crashing down in the next few years. I’m seeing the issues of complexity, overwhelm, cognitive overload really impacting people at all levels. I anticipate increased focus on radical simplification, which will get to more of a focus on effectiveness and efficiency. Would love your take on this. Thanks for asking! We should move this discussion to the linkedin post. Maybe I post my question and respond with this same respond? Love it and I will share me take! When I first saw the title, I thought, “Here it comes, the first time I disagree with Dave in a big way.” But then I read the post. I agree with the idea of using personas to understand internal roles and skills and align to buyers. But I thought you might say we need sales personas in addition to marketing personas, and I was going to rail on that idea. Sales should know the specific customer teams and organizations they are selling to. They don’t need personas; they need real people! As your other posts about Account Based Everything have addressed—we win when we know our customers as well as (or better) than they know themselves. That is not about personas. But thinking about the persona of who you need engaging with buyers at various parts of the squishy buying cycle makes a ton of sense to me. Clearly, I’m not trying hard enough Hank. Surely there is something that we cam have a vigorous debate about. I agree, the concept of persona has been terribly bastardized, enough so to have lost meaning. The real intent of this is to align the people with the right skills to have the right customer conversations at the right time. Too often, our SDRs are set up for failure from the very beginning. They are in their first sales job and are expected to prospect and engage far more experienced people on the customer. Granted they don’t have to be experts, but since they create the first impression people have of the company, they need to be equipped to carry on enough of a conversation to get to the next call. It’s hard to imagine any of these SDRs being able to carry on a reasonable conversation with C Level execs or even middle management, yet those are the “personas” many are targeting. It’s unfair to them, the customer, and causes us to miss opportunities we might otherwise be able to address. I’ve floated the idea before, but sometimes I think our best sales people might be assigned SDR roles for much of our Insight driven prospecting. 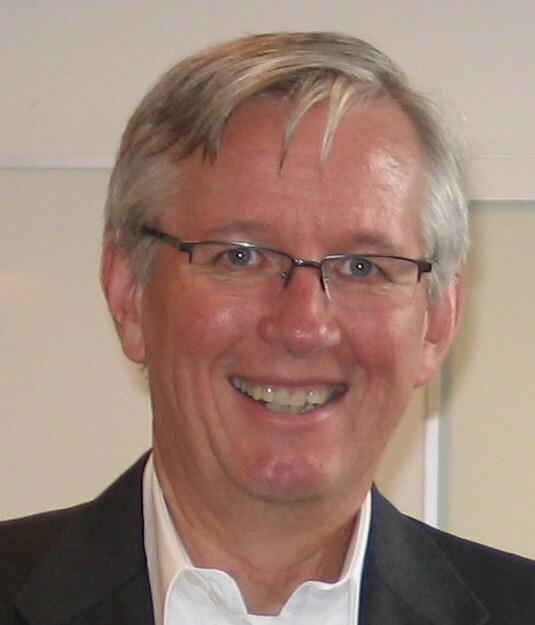 Developing seller personas can help boost the effectiveness of the sales force. It’s not only important for the sales team to understand who their ideal customer is, but for them to learn how to adjust their style depending on who they’re talking to. Sales personas can help develop that.